It may sound cliché, but the easiest way to learn Spanish is to jump in and just start learning. Fortunately, for English speakers, Spanish is an easy language to learn and speak. Actually there is no difficult language, it’s just a matter how you approach it. That’s from a linguistic point of view, and right now you might disagree. By the time you get to the end of this post, I’m pretty sure you’ll concur. That’s because you’ll be conversing in Spanish! First things first, though. You will not become an expert in Spanish from reading this post. The goal is not to complete a university course, here. The point is to chart out the easiest way to learn Spanish and to survive in a Spanish-speaking country, to understand and be understood, to accomplish your travel goals whether they be sitting at a poolside, shopping or working in your chosen profession. With a survival mindset, Spanish becomes easier to digest. We’ll happily omit choking on a ton of grammar. You’ll take just as much of the language and of daily conversation as you need to get along. Nice, right? Let’s get started. If you’re really looking for easiest way to learn Spanish, your goal is to learn ten words and phrases a day. With each successive day of the week, you’ll revise what you learned the previous days. At the end of the week, you’ll put it away and start a new set of 70 words. Then at the end of that week, you’ll also revise the words of the first week. Then you’ll repeat the process until you have all the vocabulary you think you’ll need. Each week you’ll learn new words and do a quick review of the words you learned during the previous weeks. This is called spaced repetition. It is a very effective means of storing information long term. The best way to keep track of it all is to use a single composition notebook and mark each sheet with the date of the lesson and what week the lesson belongs to. Then write the corresponding translations next to them, leaving enough room to fold the paper back. Write the Spanish words next to these. Check and see how many you got correct. Repeat Steps 1-6 until you don’t get any wrong. Poder – to be able. Can, or may in other words. 2. May I ____? 1. Puedo hacerlo. 2. ¿Puedo usar el baño? 2. Can you ___? 1. Puedes pasar. You can pass/go ahead.2. ¿Puedes ayudarme? 2. You (formal) can ___. 4. Can you (formal) ___? 1. Él/Ella puede sentarse aquí. He/She can sit here.2. Usted puede pasar. You (formal) can pass/go ahead. 3. ¿Él/Ella puede sentarse aquí? Can you (formal) help me? 2. May we ___? 1. Podemos irnos. We can go./We can leave now.2. ¿Podemos subir al autobús? May we board the bus? Tener – to have, to have to. 2. I have to ___. 3. I am ___. (Tener is only used here with certain adjectives. These are given in the examples.) 1. Tengo efectivo. I have cash.2. Tengo que irme. 1. Do you have ____? 1. ¿Tienes una pluma? 2. Do you (formal) have? 3. He/She is ____. 1. Él/Ella tiene su billete. He/She has her ticket.2. ¿Usted tiene mi pasaporte? Do you (formal) have my passport? 1. We have to ___. 1. Tenemos que comer algo primero. We have to eat something first. Ser – to be, when referring to conditions that are permanent or constant – like profession, country of origin, inherent characteristics and possession. 3. I am ____. 1. Soy americano/a. I am American.2. Soy medico. 2. Are you ____? 1. Eres bien chevere. You are so cool.2. ¿Eres un médico? 2. It is ___. 1. Es demasiado dulce. It is too sweet.2. Es mío. 1. We are ___. 1. Somos estadounidenses. 1. They are ___. 1. Ellos son mi familia. Estar – to be, when referring to location or a changeable state. There are other uses of this verb, but estar is primarily used when asking where is something, when telling where something is located, when talking about feelings (as they are changeable states) or when explaining what you are currently doing. *TIP: the English ending -ing is -ndo in Spanish. So if you’re eating, the verb comer becomes comiendo. 3. I am ___. (location) 1. Estoy contento/a. I’m happy (content).2. Estoy bañando. 3. You are ___. (location) 1. ¿Estás bien? Are you okay?2. ¿Estás cocinando? 4. Are you (formal) ___? (location) 1. Él está de mal humor. He is in a bad mood.2. Ella está preparándose para salir. She is getting ready to go. 3. We are ___. (location) 1. Estamos listos. We’re ready.2. Estamos preparándonos para salir. We’re getting ready to leave. 3. Estamos lejos, en otra ciudad. We are far away, in another city. 3. Are they ____. (location) 1. ¿Están listos? Are they ready?2. ¿Están preparando la comida? Are they making the food? 2. I’m going _____. (used with another verb) 1. Voy a la playa. I’m going to the beach.2. Voy a dormir. 1. Are we going to _____? 2. We’re going to ____. 1. ¿Vamos a la playa? Are we going to the beach?2. Vamos a salir. We’re going to leave/go out. 1. He’s going to ____. 2. She’s going to ____. 1. Él va a comer primero. He’s going to eat first.2. Ella va al supermercado. She’s going to the store. 1. They are going ____. 1. Van a bajar. They are going to come down. 1. I went ___. 1. Fui al banco. 1. He went ___. 1. Él fue al hotel. He went to the hotel. 1. We went _____. 1. Fuimos al café. We went to the cafe. 2. I want _____. (used with another verb) 1. Quiero chocolate. I want chocolate.2. Quiero bailar. 1. Do you want _____? 2. Do you want to ____? 1. ¿Quieres vainilla? Do you want vanilla?2. ¿Quieres bailar? 2. She wants to ____. 1. Él quiere comer primero. He’s going to eat first.2. Ella quiere ir al supermercado. 1. They want to ____. 1. Ellos quieren silencio. 1. We want to ___. 1. Queremos ir a la playa. Well, I know that I threw a lot at you, but I hope that you found this post helpful in laying out the easiest way to learn Spanish. Check out some of my other posts below if you’re looking to learn more. 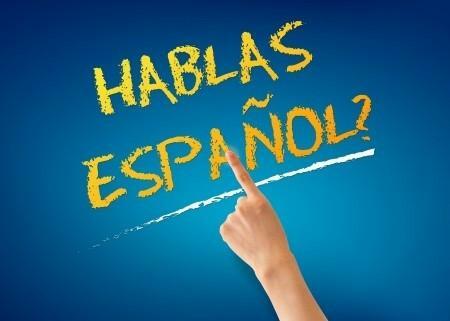 So you’re looking for the fastest way to learn Spanish? Fortunately, you’re in luck. Spanish is not so difficult to pick up for English speakers. The reality is that English and Spanish share a lot of words in common. So if you’re looking for the fastest way to learn Spanish, I suggest starting with cognates. There are so many words in English that correspond closely to their Spanish counterparts. It’s pretty easy to pronounce familiar words with a Spanish accent and be perfectly correct. Moreover Spanish speakers are generally very forgiving. So if you’re searching your memory and can’t find a word you need, say the English word with a Spanish accent or ending. So without further delay, if you’re looking for the fastest way to learn Spanish, here’s a list of some of the most common cognates. If you’re looking for the easiest way to learn Spanish, check out my other post, where I talk about the Fan Method of learning vocabulary. Of course, vocabulary and phrases are just part of speaking a language; they go hand-in-hand with culture. Like any society, Spanish speakers have cultural norms that are different from others. The more you understand and accept the differences, the less frustrating the frustrating ones will be. Family Comes First. That doesn’t mean you come last. It means that, in terms of priority, you have a lot of people that come before you. If you make an appointment with someone, and they are late (which happens a lot), the tardiness may be blamed on a family member or neighbor. (Neighbors are prioritized after family members.) In other words, as a mere acquaintance, you might get pushed to the side, but no harm is intended. All Those Hugs. When you’re introduced to someone, greeting etiquette demands shaking hands, at the least. On the second meeting (and sometimes the first), you might also receive a brief embrace, especially if you are meeting someone’s family or friend (or neighbor). Not feeling touchy-feely with strangers? You can always offer your hand, before they come at you. Be Clear, Not Pushy. Be as clear as you can about what you want or need, and leave it there. If you insist or ask more than once, you might get an annoying dose of passive-aggression and a very long wait before you receive what you wanted. In general, relax. Slow your pace and enjoy the view, the culture and the coffee. And don’t be afraid to speak what you’ve learned. You’ll find a lot of receptive, helpful people that are glad you took enough interest to study the language and are eager to give you a great impression of themselves and their country. Remember, though, if you’re looking for the fastest way to learn Spanish, cognates are your friends, so treat them well! Best of luck.